It is perhaps a good time for newspaper editors to stop publishing any more polemical opinion pieces on the great currency transfusion (‘demonetisation’). When someone argues that people standing in lines to deposit and withdraw their own money after being compelled to do so by the government, are actually engaged in “the first economic satyagraha [using] their wisdom to articulate opposition to neoliberalism”, it is time to get off the computer and go get a really stiff drink. It is abominable and grossly insensitive to suggest that people trying to cope with the currency shock are somehow engaged in a satyagraha. A satyagraha is above all a voluntary exercise. There is absolutely nothing voluntary about people standing outside banks and ATMs. The subtitle of the article proclaims that “the demonetisation drive aims to cleanse the ills of neoliberalism”. That needs a sharp intake of breath and another stiff drink. Or two. The reason why there is a shadow economy is because of the absence of liberalism, neo- or paleo-. Corruption exists because of regulation, because economic freedom and liberty are stifled. If the demonetisation drive can claim to cleanse anything, it is the ills of statism, bureaucratism and the still-extant licence-permit raj. Demonetisation is a bad way to cleanse that, but that’s a different argument. Last week The Quint had a report blaming a US aid agency and the CIA for demonetisation. Now that neoliberalism has been ritually savaged, the debate is truly over. Head to the bar, folks! They take cards. How long will the Great Currency Swap be popular? Update: This is an updated version of the chart. The excess of schadenfreude over inconvenience constitutes the level of support for the the policy. The excess of inconvenience over schadenfreude constitutes resentment against the policy. As of 15th December 2016, people still feel that the inconvenience is a price worth paying to ensure that those with unaccounted incomes suffer relatively more. Note that this is a schematic, and the shape of the curves in this chart is not a forecast: events can move them in time or change their shapes. For instance, if inconvenience continues to grow as people and businesses run out of adequate cash, and if they come to believe that the holders of unaccounted money are getting away relatively unscathed, then we might head towards point B, where resentment builds up. Then, as the situation eases — with adequate cash being pumped back into circulation, and with people adapting to a less-cash lifestyle — the resentment will begin to taper down towards point C.
The chart assumes that schadenfreude will diminish over time, in which case at point C, support and resentment will cancel each other out. However, if schadenfreude does not diminish, the policy will continue to enjoy popular support. The Modi government can prevent or mitigate the rise of resentment by reducing inconvenience and by feeding schadenfreude. The former, by supplying enough currency quickly, before point A is reached. The latter way is to persuade the public that wrongdoers are getting their just deserts. However, as people hear news of seizures of hoards of new currency, or of others circumventing the moves using clever methods, the schadenfreude is likely to fall sharply. The greatest danger to the Modi government, and to Prime Minister Modi himself, is if inconvenience does not fall, or fall quickly enough, and it continues to rise beyond point B. Author Nitin PaiPosted on 15th December 2016 20th December 2016 Categories Economy, Public PolicyTags corruption, currency, economic reforms, liberalisation, monetary policy, Narendra Modi, public opinion3 Comments on How long will the Great Currency Swap be popular? The best use of his store of political capital is to undertake big ticket economic reforms. When a small Takshashila team walked around Bangalore’s wholesale markets, Dobbspet town and a few tiny village in the latter’s vicinity as part of our #FootNote initiative, we noticed many people reporting that they were not only inconvenienced but suffered monetary losses, yet supported Narendra Modi’s currency reform (‘demonetisation’) initiative. This is counter-intuitive, except perhaps in the context of religious faith. 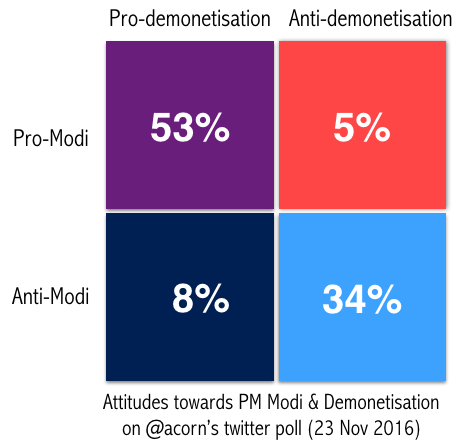 To better understand this phenomenon, I conducted a twitter poll earlier this week that sought to investigate to what extent have people conflated their opinion of Prime Minister Modi and his currency reform initiative. Obviously, there is no claim that this poll is representative of the entire population of India. It is more likely representative of the forty thousand or so people who follow my twitter handle. Even so, the responses are interesting, and support what we noticed on the #FootNote tour. What does this mean? As Karthik Shashidhar, our resident quant, remarked, in 87% of the respondents there is an overlap between their opinion of Mr Modi and his policy. In other words, people’s attitude towards him overshadows their opinion of his policy. My colleague Nidhi Gupta, who recently reviewed Christopher Achen and Larry Bartels’ Democracy for Realists (Princeton University Press), that exposes the flaws of democratic systems, noted that in this case too, the notion that people vote on issues does not seem to hold up. We’ll repeat the poll again in January to see how much the responses change. In any event, the upshot is that the demonetisation episode shows that Mr Modi enjoys tremendous political capital that he can use to implement the type of structural reforms that would be extremely difficult for other leaders to pull off. He should not lose the opportunity. Postscript: Mr Modi’s team conducted their own poll using his smartphone app. Both the framing of the questions and the type of sample suggest that the poll is essentially a device to rally his supporters rather than obtain an objective estimate of public opinion. It would be wrong to assume it reflects what Indians think, just as it would be wrong to use my twitter poll for the same purpose. The mutual love fest continues. As we noted a few months ago, it’s set to continue because India is popular among the young. We do not have survey data, but it’s likely that the situation is mirrored in India. Move over Wikileaks, the sit-back-and-take-notice piece of information comes from Pew Global Attitudes Project. It’s latest report on attitudes towards extremism shows just how bad the world’s Pakistan problem is. Pakistanis overwhelmingly support making segregation of men and women in the workplace the law in their country (85%), and comparable percentages favor instituting harsh punishments such as stoning people who commit adultery (82%), whippings and cutting off of hands for crimes like theft and robbery (82%), and the death penalty for those who leave the Muslim religion (76%). Support for gender segregation and for severe punishments is pervasive across all demographic and regional groups. Almost all Pakistanis say that terrorism is a big problem. They disapprove of terrorist and militant groups that directly or indirectly target Pakistanis. Disapproval ratings for al-Qaeda, ‘The Taliban’ (presumably the Mullah Omar group), Tehrik-i-Taliban (Pakistan Taliban) and Afghan Taliban are 53%, 65%, 51% and 49% respectively. When it comes to the Lashkar-e-Taiba (LeT), a group that attacks India the disapproval rate falls to 35%. The LeT enjoys higher support too—at 25% it beats al-Qaeda and the Tehrik-i-Taliban who are tied at 18% for the second place. As many as 40% of the respondents answered “don’t know” or refused to answer to the question whether they viewed the Lashkar-e-Taiba favourably. Even if we accept the the improbable contention that four in ten Pakistanis somehow do not know about the LeT despite its nationwide presence, the fact that such a large proportion of the population is ambivalent about this outfit strengthens the hands of its supporters. What does all this mean? Well, that the majority of Pakistanis disapprove of extremist groups only to the extent that they cause trouble for and in their own country. When seen in the context of their perception of the threat from India and the salience of the Kashmir issue, their ambivalence towards the LeT is understandable. Also understandable is why neither the Pakistani civilian government nor the Pakistan army will act against the LeT. It supports our argument that there is a limit to which the Pakistani army can genuinely fight jihadi groups—how long can they fight those who share the same vision? In this context, it is not difficult for the military-jihadi complex to engineer events to pursue its own geopolitical agenda. What is not understandable though is just why anyone—in Washington, New Delhi or even in Pakistan itself—thinks that endogenous change is possible. The United States is deeply unpopular despite all the financial, political and diplomatic support it gives. President Zardari is deeply unpopular despite his perhaps genuine attempts to improve relations with India, which ostensibly, is what three in four Pakistanis say they support. General Kayani and the military are held in high regard, despite their obvious lack of interest in quelling extremist groups and in improving relations with India. More than averages it is the margins that are important. At the margin, Pakistanis have grown closer and more accommodative of extremism and its practitioners. And Obama administration officials want the Pakistani government to continue the “strategic shift” away from militant groups. It’s not happening, Barack! Out of the seas the home secretary churned comes a spot of nectar. It took the controversy created by G K Pillai’s comments about the ISI’s role in the 26/11 attacks on Mumbai for the Indian government to act on this. The home ministry has appointed a spokesman who will “interact with journalists at a specified time daily.” That’s a good move—but it must be backed by the spokesman being supported by staff competent in public communications and new media. While the spokesman can meet journalists on a daily basis, his department must work round the clock putting out authoritative official versions of facts out there. The external affairs ministry’s public diplomacy division recently got onto Twitter. Home should follow. Results from Gallup’s latest Country Favourability poll (linkthanks Rohit Pradhan) show that India continues to be among the most popular countries in the United States. There’s been a slight decline in percentage of respondents who rated India positively—from 69% in 2008 to 66% in 2010—but this is part of an overall trend affecting other countries too. Either US public opinion is seeing the world a little less favourably (hey, even Canada —Canada!—dropped 2%) or it’s something to do with statistics. Notably India is more popular with younger Americans—76% in the age group of 18-34, 67% in the age group of 35-54 but only 60% among people 55 years or older. That holds promise for the future. The love is more than reciprocated. Pew Global Attitudes survey results over the last few years show that the United States’ popularity in India has been steadily rising since 2006, and last year stood at a record high of 76% among those surveyed. But does the United States’ popularity suggest an endorsement of the US leadership? The Pew survey suggests that Indians have more confidence in President Obama than in President George W Bush (77% vs 55%); but a Gallup poll shows that their approval ratings fell in the same period (from 31% in 2008 to 26% in 2009). Different surveys, different questions yes, but to the extent that the questions are related, the responses point in opposing directions. President Obama’s campaign rhetoric (remember the reference to Bangalore and that bit about appointing a special envoy for Kashmir?) and policy agenda in his first year (approach to China, Af-Pak policy) might have contributed to increase in Indian disapproval. On the other hand, his persona might have caused Indians, like their American counterparts, to have greater confidence in his leadership. So here are some results from a survey conducted by ABC News between late December 2008 and early January 2009: “a random national sample” of 1534 adult Afghans across the 34 provinces were asked a number of questions in face-to-face interviews. India, it turns out, is big in Afghanistan. Almost three in four Afghans had a favourable impression of India, making it the most popular country in Afghanistan, bar none. When asked for their opinion of the role countries were playing in Afghanistan at this time, India still comes out on top. Although the United States has the highest proportion of positive ratings (44%) it also has a large proportion of negative rating (36%). India ranks slightly lower (41%) in terms of positive perceptions, but only 10% of the Afghans polled thought it was playing a negative role. This is explicable, because Indian troops are not engaged in counter-insurgency operations, unlike the Americans. The favourable perception of India outweighs the positive opinion of the role it is playing in Afghanistan. Some of that might be due to distance, and as the surveyors suggest, due to sympathy for fellow sufferers of Pakistani machinations. But India’s role is helping maintain India’s popularity. Still there is an equal proportion of Afghans (42%) who are neutral about India’s role. This gap probably suggests to them that India could do better. As indeed, it could. Ajay Shah links to a Gallup poll that reveals that India is the fifth most favoured nation among Americans. 69% of respondents rated India favourably. Americans, it seems, reciprocate the love. Interestingly, overall, 55% of Americans rate China unfavourably. Interestingly, a young Americans are favourably disposed towards the country (60%) while Republicans and older Americans are not (~35%). So it’ll be interesting to see if China becomes more popular over time, or Americans will change their minds once they lose their innocence.